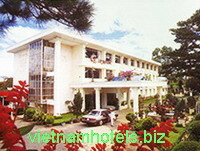 Address: 11 Dinh Tien Hoang Street, Dalat, Viet Nam. The 2- star international hotel , with 36 bedrooms, lying next to Da Lat Golf Court – is a place with the natural landscape heavily bearing specific traits of a multiple - flower city - Dalat: tranquil, gentle, and ideal for rest and relaxation with poetic natural landscapes, deserving a paradise for rests and relaxation. The hospitable and professional system of restaurants and of support services, spacious and safe parking lots is the advantage for wiping off your anxieties upon your choice of Golf 1. Restaurant serves all varieties of dishes including Asian, Continental, European and Vietnamese local specialities. Private dining room - Bed and breakfast - Catering for official ceremonies, private and conferences capacity 200 persons.